Only selecting 3 food Specialties from Madrid may seem too few. Spanish food is as good as it is varied and that’s not just my opinion, but also the opinion of tourists, locals. There are a great number of Spanish chefs who are jumping on the international scene. Yet unfortunately, many times, in the eyes of travelers, Spanish food is reduced to paella and sangria, forgetting the typical dishes from each area that are worth tasting. Madrid, the capital of Spain, has a wide range of cuisine, closely linked to its vibrant social life. And from the mixture of these two features come many of the most typical dishes and meals of the Spanish capital. Forget everything you think about Spanish food. 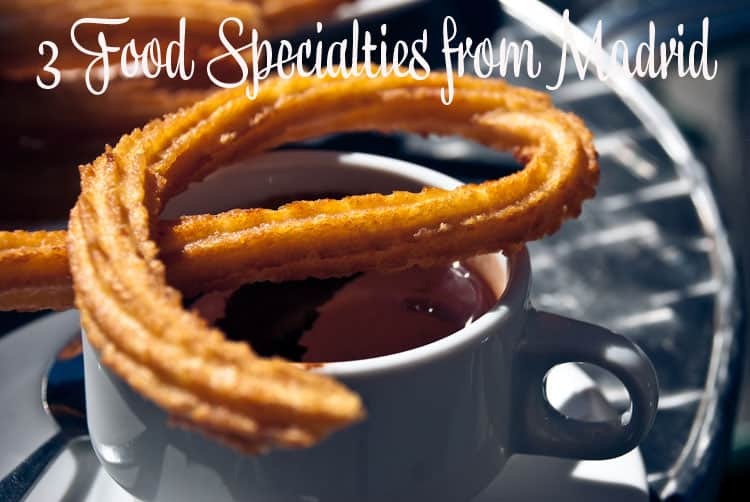 If you’re spending a few days in the capitol don’t miss these 3 food specialties from Madrid! 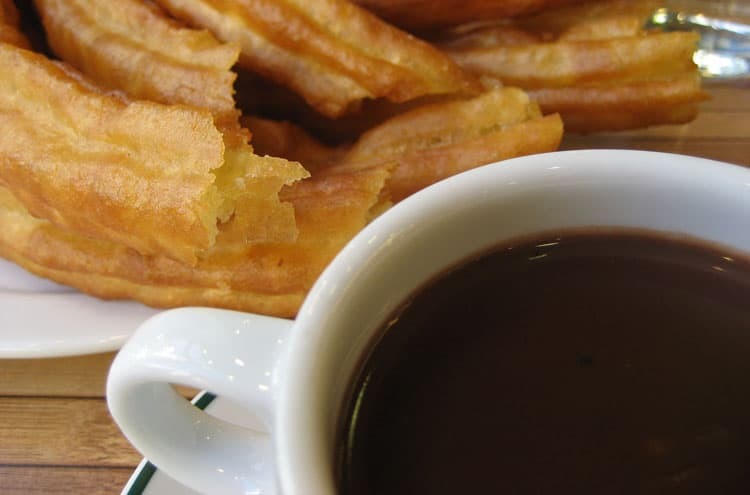 Have a cup of hot chocolate with churros (small deep-fried batter sticks), or porras (big, straight doughnuts, also deep-fried), especially for breakfast.It’s a sweet and delicious way to start your day. You’ll see lots of chocolaterías in Madrid, but one of the most traditional is Chocolatería San Ginés. Opened in 1894, part of its charm lies in its ancient decor and furnishings as well as its hot chocolate served in traditional cups and accompanied by delicious churros or porras. This “chocolatería” is open 24/7 and it’s usually full at early morning, when people coming from the famous disco Joy Slava, located next door, get out to have a hot chocolate before going home. 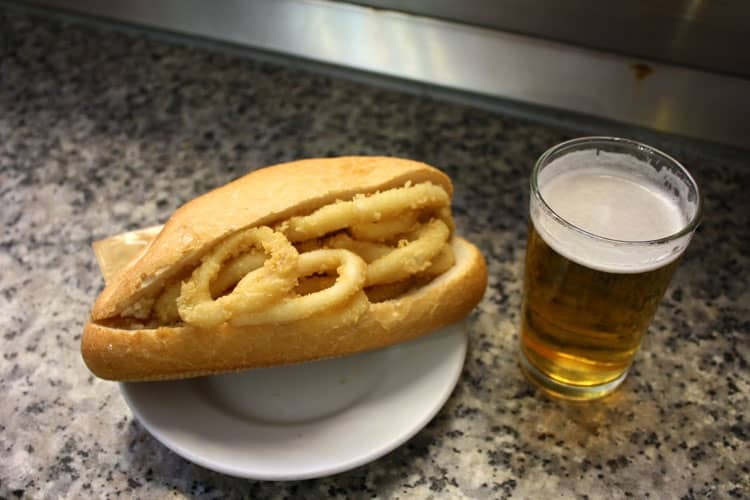 The calamari sandwich is a very common specialty in Spain and consists of squid coated in flour and fried in oil. It’s usually accompanied by lemon or mayonnaise but overall by a very cold beer. This sandwich is so popular in Madrid that it can be found in many bars but the most typical spots to find them are the ones in the Plaza Mayor, where you can enjoy your sandwich either inside or on the terrace. Furthermore, it’s an affordable option because the price is usually around 3.50€. If you want to eat a more hearty dish, don’t miss the Madrid stew, perhaps the most representative dish of Madrid’s cuisine. This dish consists of chickpeas, vegetables, and meat and it’s very common in winter. The classic way to serve it is separating its ingredients, cooked, into three clearly separated services or vuelcos. 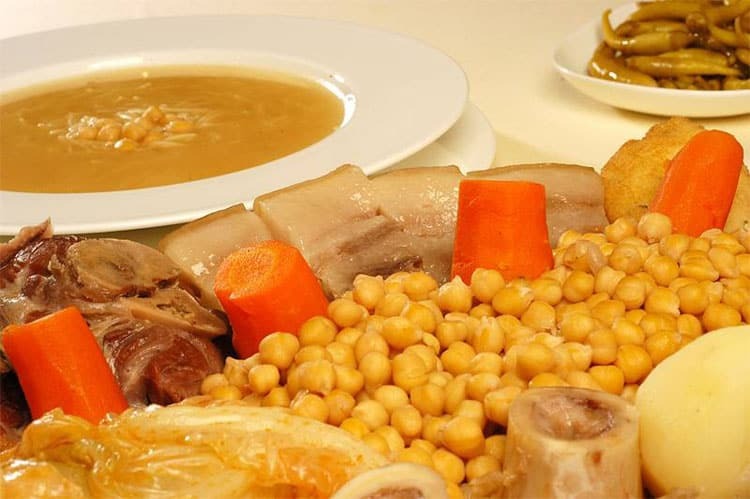 The first contains the resulting soup from cooking all the ingredients, the second contains the chickpeas, vegetables and potatoes and the third, the meat (usually eaten in this order). Many restaurants now reduce this dish in just two vuelcos. One of the most typical restaurants is La Bola, a family tavern opened on 1870, where Madrid stew is served in individual clay pots and cooked in slow fire of charcoal, as the ancient times. So next time you go to Madrid you already know what to eat and where, so you can feel like a real Madrid citizen. But take into account that if you eat a Madrid stew for lunch you will probably need to go back to your hotel or apartment for a “siesta”. How about you? 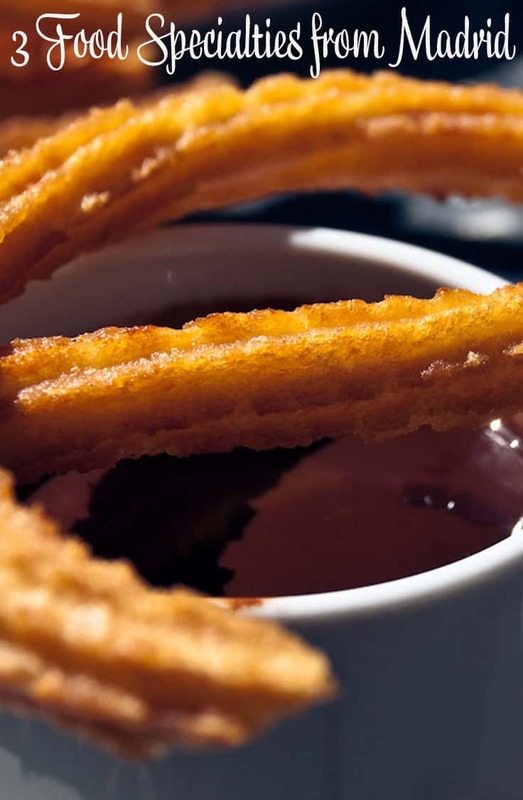 Have you tried any of these dishes in Madrid? I lived in Madrid and I can only approve! I always loved the name Marta! (Sound of Music) I’m much happier, too, since I started telling my own stories. Wonderful photos. I have seen so much food on Andi’s blog that I’ve never experienced. It really does open my eyes to the possibilities! Loved this post — brought back so many memories of my first visit to Spain, which included a stop in two cities: Madrid and Barcelona. (I’ve since been back to Spain – it’s one of my favorite holiday destinations.) I’m addicted to churrus con chocolate — addicted. I haven’t had the squid sandwich, but way back when during my first visit to Spain when I was still eating meat, I did have the “Madrid Stew”. Very delicious and hearty. Definitely warms you up. Such fond memories! @BrainyPintSize, I have never had a bad anything to eat in Spain! The food is amazing! And @BrainyPintSizer, let me know what you think about the squid sandwich if you have the chance to try it next time!